Dr.Malpani's Blog: Why do Infertility Doctors Treat Abnormalities which are of No Clinical Importance ? Why do Infertility Doctors Treat Abnormalities which are of No Clinical Importance ? Modern medical practice seems to be based largely on ordering tests and scans, and relying on these to make a diagnosis. This seems to be true for infertility specialists as well. These procedures have nudged into the shadows the time-tested traditional methods of taking a medical history and doing a clinical examination. The problem with most of these tests is that they also pick up a lot of minor abnormalities, which have absolutely no clinical importance. In fact, the more expensive the test (because it’s brand new or uses highly sensitive technology), the greater the chances of the results coming back as abnormal! While many of these abnormalities are also found in fertile couples as well, doctors tend to get very excited when they find these. Many doctors take pride in finding and highlighting these abnormalities- and there are many reasons they do so. • Since they are often clueless about the natural history of a disease and the prevalence of the abnormality in the general population, they tend to over diagnose and over-treat. They jump to erroneous conclusions, based on the flawed belief that where’s there’s smoke, there must be fire ! It’s very common to find small ovarian cysts or tiny fibroids when vaginal ultrasound scans are done for infertile women. This sets up a positive virtuous cycle for the doctor, who can claim that he has finally made the right diagnosis, and is now justified in doing additional procedures to solve the problem. However, from the patient's point if of view, this becomes a negative vicious cycle, because a lot of these abnormalities are just incidental findings which are of no clinical importance and are best left alone. However, patients now start stressing about these little incidental findings. They don’t want to feel that they have left any stone unturned and permit the doctor to subject them to unnecessary interventions and procedures; in most instances, this causes more harm than good. A common example is a laparoscopic surgery to “treat” a small cyst. 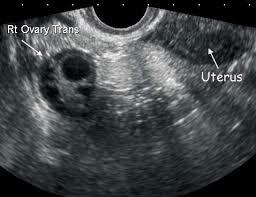 The sonographer highlights these abnormalities by printing them in bold or in italics. Doctors get paid to order tests and do procedures, and many of them will unthinkingly be inclined to do this. Unfortunately, none of this is in the patient's best interest. The biggest tragedy is that the poor patients don’t even realize that they have been subjected to unnecessary testing! When the test reports some abnormality, they just feel a sense of relief that their brilliant doctor has been able to find the problem, it will get “treated” and their chances of getting pregnant will increase. It’s only the more mature and experienced doctors who understand the importance of masterly inactivity. Unfortunately, doctors don’t get paid to do nothing – and not enough patients have the maturity to understand that only a superior doctor will advise a hands-off approach. There are some patients who are proactive in learning more about infertility and who actively participate in their treatment. These patients are well-informed and they know that there is no need to worry about every little abnormality seen on a scan, & that often the best treatment is to do nothing. Intelligent patients can also try to protect themselves from overtreatment by getting a second opinion. Unfortunately, this effort too trends in the same direction; as the doctor who provides the second opinion is incentivized to perform a procedure and the patient gets caught in a vicious circle of sorts. This is why it’s important to get a second opinion from a retired surgeon, who has years of experience and expertise, and who doesn't operate anymore, because he will be able to explain to you why a hands-off approach is in your best interests.